Close to Srebarna nature reserve, the lodge has been purpose built in a local and traditional architectural style. It has 7 en suite rooms with hot water, heating, air conditioning, television and internet access. The lodge also has a large "mehana" where you can relax and consume your drinks and meals. 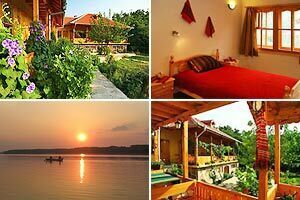 Pelican Lodge, is situated in a beautiful natural setting, offering you tranquility, a warm Bulgarian welcome, and a range of outdoor holiday activities. The lodge is situated next to a small wood which abounds with bird song, the wood also attracts butterflies, damsel and dragonflies, mammals and rare plants.